Unpacking after my trip to Tucson made me think about how many miles I walked that week. I’ll bet there is an app on my smart phone for that. It’s unusual to be on your feet for 6 days straight from 10:00am until 7:00pm. Granted the pace is slow, and the right walking shoe is paramount. 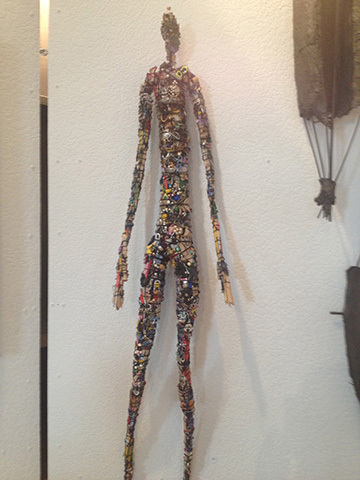 This year I counted 37 venues in the Tucson Show Guide, of which we visited 16. Quite a few are termed, ‘mineral & fossil’ shows, and there are plenty of raw specimens, fossils, etc. The African Art Village is a venue with art and beads. The week is an amazing experience-very overwhelming and exhilarating too. So hard to fall asleep each night, with visions of gems in my head swimming around. 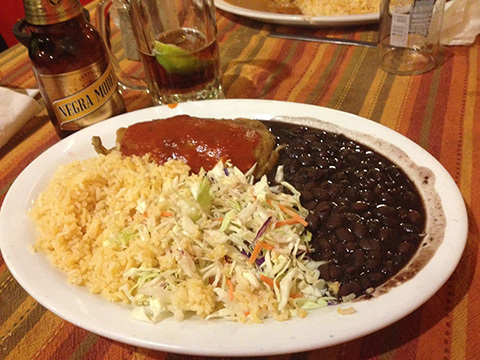 Here’s a peek into some of the things we came across, and some of the food we enjoyed–all Mexican of course! 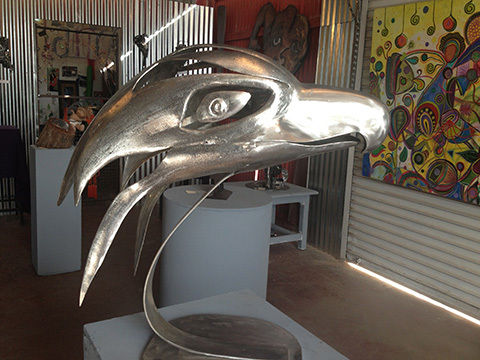 We did take one side trip to a few art galleries, where the Tucson Sculpture Festival was being shown. 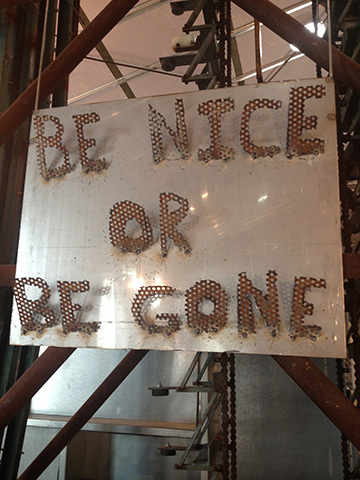 The Whistle Stop Depot, a reworked train depot along the tracks at 127 West 5th Street, and the Sculpture Resource Center, 640 North Stone Ave.
Whistle Depot was made almost entirely of re-purposed materials. 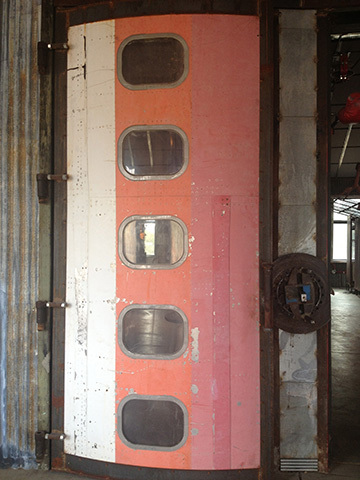 The main door came from an airplane. 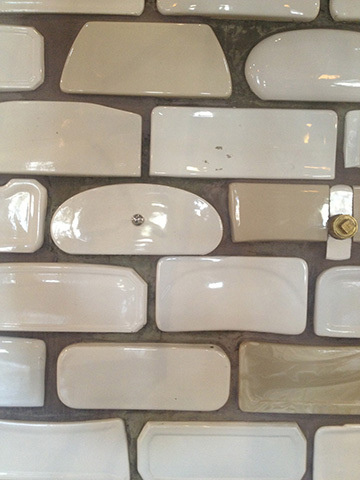 This wall composed of toilet tops embedded in concrete. 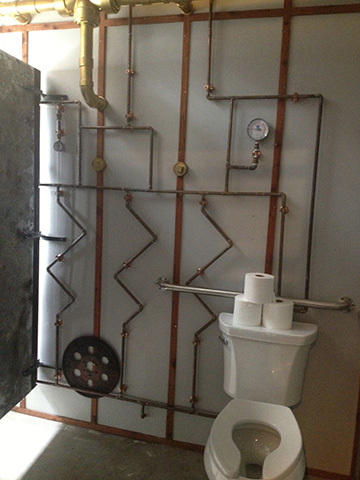 The bathrooms were unique and had lots of metal and copper. 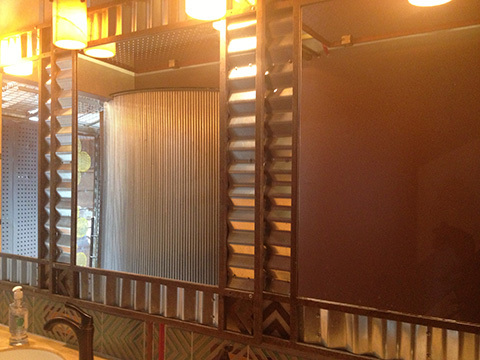 Corrugated metal surround the mirrors. 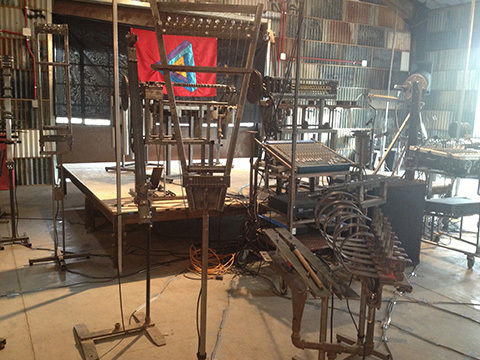 The sculpture exhibit featured re-purposed art. I apologize for not keeping a log of artists who were showing there! 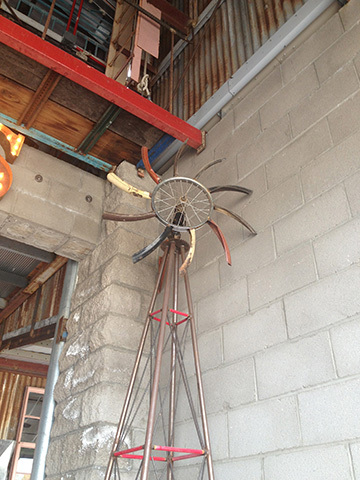 This small gallery had an outside sculpture garden as well. Back to the Whistle Stop Depot. They had an entire orchestra made from metal–wish we could have heard the concert but did get a CD. Outside, I love this wind mill. check out all the innards! 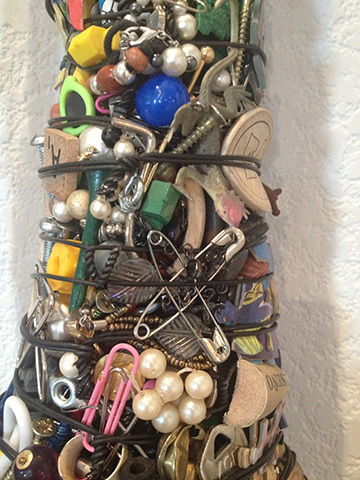 Here is a close up of all the materials inside this crazy piece. 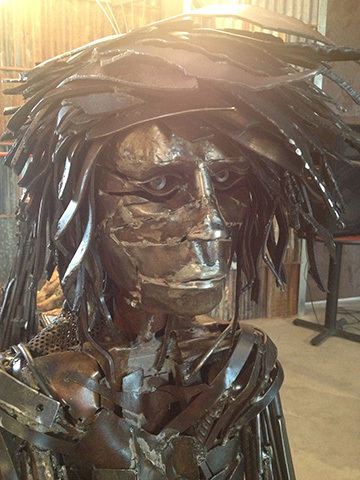 Love this use of metals and welding and wow–crazy hair! On to food. 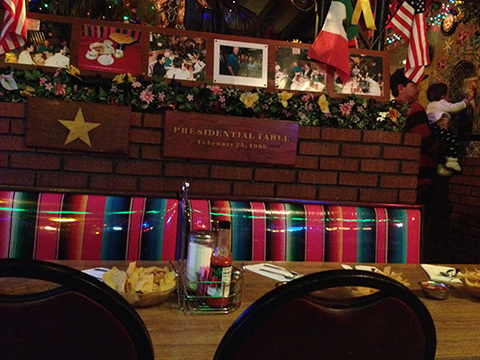 We frequent some of the same restaurants each year, this year we sat next to the table where President Clinton sat years ago and ordered an enormous amount of food. 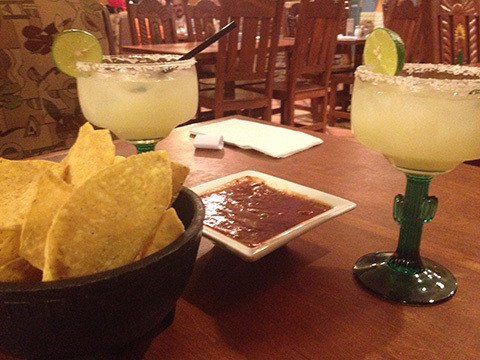 The wait is always over an hour, as the locals love this place–order a margarita & relax at Mi Nidito. 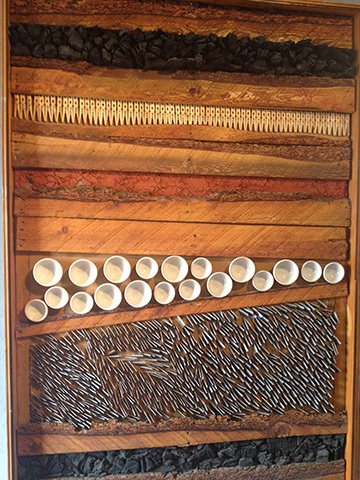 Our other favorite is near the college campus and is run by Sandra, a woman from Guatemela, Maya Quetzal. It’s tucked into Fourth Street where they are now running a trolley. Her business barely survived through the construction and we were happy to see the restaurant busy with people. 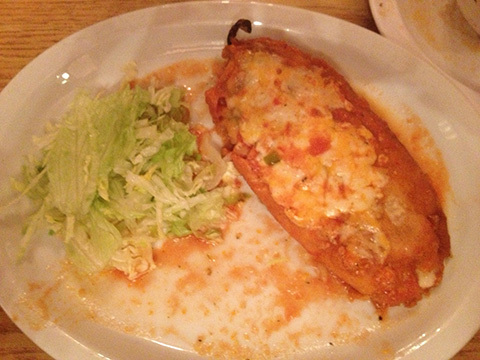 My favorite is the spinach stuffed Chile Relleno. Our other must stop is a small local place, Taquiera Pico de Gallo. Which happens to be a cup of fresh fruit, sprinkled with red chile powder–apparently different in regions of Mexico. They have great fish tacos with handmade corn tortillas and if you are early enough the Horicata is heavenly. El Minuto is a favorite and next door to the convention center where the AGTA show and GJX take place. They serve a great chile relleno. 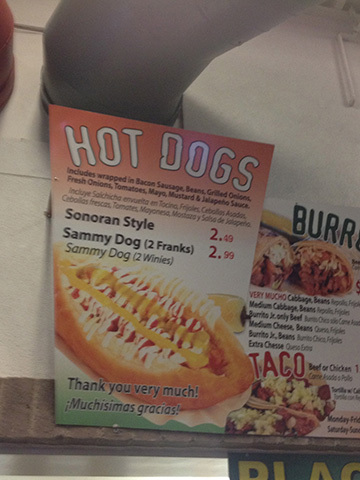 We decided to try the infamous “Sonoran Hotdog”. A culinary treat-a hotdog wrapped in bacon, in a unique bread ‘boat’ piled with fresh onions, grilled onions, beans, tomato, mayo, mustard, and jalapeno sauce. Reminded me somewhat of a Pinks hotdog in Hollywood. hey–it’s only once a year! 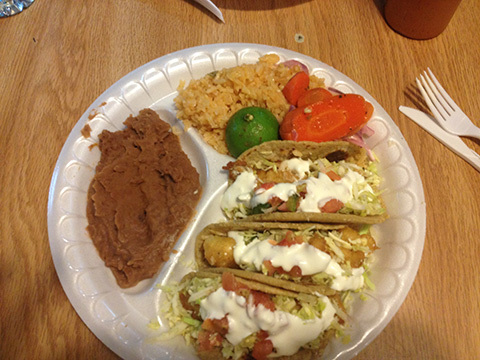 We could probably call our culinary picks in Tucson the “best dives to get great food”. They are not fancy, but they are really good. They are full of locals. 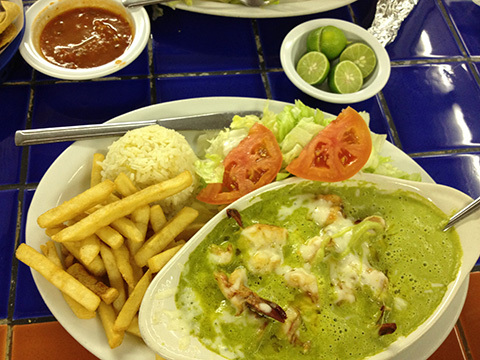 Our last favorite we go back to each year is Mariscos Chihuahua, for a dish I’ve not had outside of Tucson called “Camerones Culichi” I found a guy on youtube making it once, it’s cream and chiles blended into a wonderful sauce for seafood. 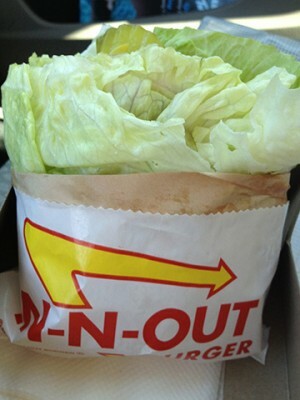 We did try it one other place years ago but it was not as good. We did shorten our stay this year, as the more you shop–well, you know what I’m going to say–the more money you tend to spend! So once again, it was worth the trip, I found tons of new tools, beads, pearls, stones, etc. etc. to work with. Cheers to a fun week!